Hiking One of the Most Scenic Trails Near Washington, D.C. The Billy Goat Trail at Great Falls, Maryland is one of the most scenic and challenging hiking trails in the Washington, D.C. area. Three separate loops follow a total of 8 miles providing spectacular views along the rocky cliffs above the Potomac River. The Billy Goat Trail is maintained by the National Park Service, and it is part of the Chesapeake & Ohio Canal National Historical Park, located in Montgomery County. Three separate circuits on the Billy Goat Trail follow the cliffs above the C & O Canal. They are called Sections A, B, and C, and can each be hiked independently by returning via the canal towpath. Section A is the most challenging stretch and the favorite with local hikers as it has the best views of Great Falls. The most demanding route of the hike is Billy Goat Trail A, with a rough and rocky terrain which requires hikers to scramble over and around huge boulders. Section A starts below Great Falls near the Stop Gate and ends on the towpath just upstream from the Park's Angler's access point. Much of the trail is a single passageway. Billy Goat Trail Section B is 1.4 miles long, and it is a moderately difficult trail that passes through a floodplain forest. Here you'll find fewer rock scrambles and a quieter atmosphere than Trail A. Section B includes a small sandy beach and lots of rock outcroppings that are ideal for enjoying a picnic and scenic views. Section C of the Billy Goat Trail is a 1.7-mile loop that comes back along the C&O Canal. It is the easiest of the three sections, although there are still a few rock outcroppings to traverse. The trail offers outstanding views of the Potomac River and a small waterfall. Section C has abundant spring wildflowers and its fall colors are stunning. 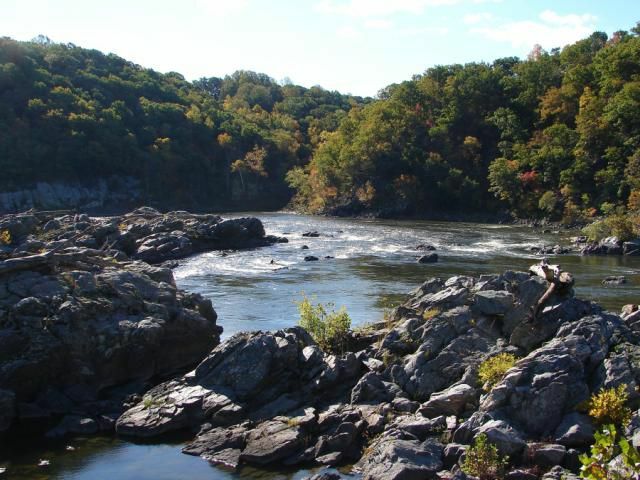 The Potomac River is whitewater near Great Falls and attracts experienced kayakers who practice their skills along the waters just below the Billy Goat Trail. It is fun to watch them but beware that the currents are strong here and can be dangerous. Don't wade or swim in the river. Wear your sturdiest boots and bring water. Stay off slippery rocks and cliff faces. If you're hiking on the weekend, be sure to arrive early to miss the crowds, especially on Trail A. Pets are not allowed at all on Section A, and they must be leashed on Trails B and C. The trail is marked with blue blazes, but you should bring a map. To hike Sections A or B, park at Anglers recreational area; if you're interested in Section C, use the Carderock recreational area. You'll find a ranger station at the Great Falls Tavern Visitor Center, as well as restrooms, picnic areas, and a snack bar where you can get extra water.